Cruise & Maritime Voyages offer a more traditional British cruise experience with a leisurely and friendly atmosphere. Sailing from a choice of 15 regional ports in the UK, you can discover more interesting and remote ports of call with their fleet of small to mid-size classic style ships. With their fantastic buy one get one free offer, the first adult passengers pays and the second passenger travels FREE! Cruise & Maritime Voyages are offered for sale in the UK by South Quay Travel & Leisure Ltd trading as Cruise & Maritime Voyages. Gratuities at £7 per person per night debited to your on board account. Prices are per person based on two adults sharing a twin cabin, subject to availability. Offers are applicable to new bookings and can be withdrawn at anytime. Seek out life’s true riches Introducing our sparkling NEW 2020/21 winter sun collection. Your chance to experience travel at its most enriching. Book your P&O Cruises winter 2020/21 holiday by 29th April 2019 to enjoy a 5% low deposit◊, and up to 10% discount* on Select Price holidays. Plus, extra guests sail from £1 per person on applicable holidays to/from Southampton. All prices quoted are per person and based on 2 adults sharing unless otherwise stated and are correct at time of print. Prices are subject to availability and change and can be withdrawn at any time. Full operator terms and conditions apply ask us for details. Step into places that are the living embodiment of La Dolce Vita, as from your elegant spa base, you journey to the famous Ligurian coastal resorts of Santa Margherita and ultra-chic Portofino, longtime exclusive hideaway. On a captivating tour exuding Italian charm, colour and warmth, you’ll also take in Florence, the exquisite ‘Cradle of the Renaissance’ and one of Italy’s most stylish cities, as well as Pisa and Lucca, two more Tuscan gems. Choose from a wide selection of carefully selected hotels in a quartet of hand picked, highly favoured locations, and enjoy a relaxed stay on the sunblessed shores of this, Italy’s largest, most spectacular and most popular lake. With clear blue waters fringed by stylish, elegant, colourful resorts, flanked by groves of citrus trees or olives, or backed by the wooded slopes of craggy mountains, this is a perfect picture-postcard scene which has drawn visitors down the years. Enjoy a week on the shores of the most picturesque of the Italian lakes, with its elegant villas and glorious gardens – a scene which has inspired artists and writers for generations – and combine rest and relaxation with some wonderful excursions, including a journey on the spectacularly scenic Bernina Express to chic St Moritz, fabled refuge of the wellheeled, and the chance to discover stylish Milan and idyllic Lugano. Full of included highlights, this enjoyable holiday, based on the shores of the Adriatic, lifts the veil on a fascinating region of Italy. Discover ancient, whitewashed Cisternino, stunning hill-town Ostuni, Alberobello and its conical trulli houses, and visit the extraordinary caves at Matera. A visit to Baroque gem Lecce and the opportunity, on an optional excursion, to discover Castellana’s famous cave network, wine-producing Locorotondo. All prices quoted are per person and based on 2 adults sharing unless otherwise stated and are correct at time of print. Prices are subject to availability and change and can be withdrawn at any time. Full operator terms and conditions apply - ask us for details. 2 ADDITIONAL BENEFITS Norweigian Cruise Line have re-imagined the concept of freedom, flexibility and choice with the launch of Free At Sea* – their superb new premium cruise product. It enables you to design your own bespoke holiday, adding your choice of valuable extra benefits and luxuries that will make your cruise unique from as little as £99 per person on top of the great value base fare. *Price includes Free at Sea upgrade. All prices quoted are per person and based on 2 adults sharing unless otherwise stated and are correct at time of print. Prices are subject to availability and change and can be withdrawn at any time. Full cruise operator terms and conditions apply ask for details. *£99 deposit is available on majority of Titan holidays. ^Excludes essential collection. All prices quoted are per person and based on 2 adults sharing unless otherwise stated and are correct at time of print. Prices are subject to availability and change and can be withdrawn at any time. Full operator terms and conditions apply - ask us for details. Three Cruises for the Price of Two Book one cruise departing in 2019, along with any two cruises from Fred. Olsen’s full Ocean & River programmes and the lowest-priced sailing is FREE! * Fares are per person, based on twin occupancy of the lead-in twin room, subject to availability. Offers may be amended or withdrawn at any time without prior notice, are subject to availability & cannot be applied retrospectively. All bookings are subject to Fred. Olsen's standard terms & conditions - ask us for details. Some ports may be at anchor, intermediate days are at sea. FOCL reserve the right to amend itineraries for operational reasons. E&OE. Cuba is changing fast, so this is a great time to visit while its exotic and distinctive style remains. Discover faded colonial grandeur in Havana and Trinidad, delightful rolling countryside, tobacco and coffee plantations, the historical sites of the revolution and the ever-present rhythms of the son and mambo styles of music. Discover a different side to China on this journey from Beijing to Shanghai. Fully escorted and travelling with a group of solo travellers, enjoy a walk along Xian’s ancient city walls, learn the secrets of Chinese cooking and try your hand at calligraphy, complemented by visits to the classic sights of the Terracotta Warriors, the Forbidden City and the panda sanctuary near Chengdu. Offers valid until 31st April 2019. Subject to availability. Other departure dates available at a supplement. 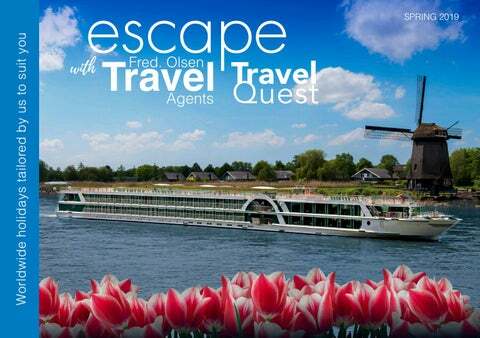 E SAVE UP TO £ 250PP ON TH ECTION 2020 RIVER CRUISE COLL Whether you’re meeting the wine growers of the Douro, exploring the historic cities of the Danube or admiring the floral delights of the Dutch and Belgian waterways, our river cruises get you closer to the destinations you visit. • Celebrity guests on board on selected river cruises • Included excursions on selected river cruises • Fly from your local airport with a choice of flights from up to 12 local airports All prices quoted are per person and based on 2 adults sharing unless otherwise stated and are correct at time of print. Prices are subject to availability and change and can be withdrawn at any time. Full operator terms and conditions apply - ask us for details. on your SUMMER STAY* *Discount is valid on accommodation cost only, on stays between 1st May and 31st October 2019, for new reservations only made before 30th April 2019, subject to availability and can be withdrawn at any time. Full operator terms and conditions apply. Price includes return flights from London, 1-night pre cruise stay at the Grand Case Beach Club on a bed & breakfast basis, 20% Early Booking Discount on Treasure Islands and 20% Early Booking Discount on Leeward Islands sailing when booked before 30th April 2019 plus 5% back to back discount*, all non UK transfers, port charges. Price is cruise only per person based on 2 adults sharing a cabin - subject to availability. Dreaming of exploring the world’s most beautiful destinations on a modern luxury holiday? With Celebrity Cruises’ sensational spring offers, it’s easier than ever to make it happen! All prices quoted are per person and based on 2 adults sharing unless otherwise stated and are correct at time of print. Prices are subject to availability and change and can be withdrawn at any time. Full operator terms and conditions apply - ask us for details. With 16 unique resorts in Jamaica, Antigua, Saint Lucia, the Bahamas, Grenada and Barbados, each Sandals Resort offers an unparalleled array of inclusions, situated in the most idyllic Caribbean setting. Sandals revolutionised the all-inclusive offering when they introduced the Luxury Included ® concept. But what does this mean? It means indulging in the best of the best. The Caribbean’s best beaches • Unique rooms & suites • 5-Star Global Gourmet™ dining • Unlimited premium brand drinks • Exciting land & water sports • Plus so much more. All of which you can enjoy all the time, any time. Embrace an unforgettable journey where every luxury is included. The Regent Experience has long been absolute in its inclusiveness, seeking to provide guests with the most enriching and luxurious journey on the seven seas. *Terms and conditions apply. Please see your local Travel Agent for full details. From November 2020 to May 2021, the Cunard fleet will travel 138,833 nautical miles visiting incredible places across the globe. The most famous cruise ships in the world call at 94 destinations in 38 different countries, including 4 maiden calls for their current fleet. Each voyage, whether it’s a 2 night short break or a full 108 night world voyage aims to deliver refined journeys for their guests. All prices quoted are per person and based on 2 adults sharing unless otherwise stated and are correct at time of print. Prices are subject to availability and change and can be withdrawn at any time. Full operator terms and conditions apply - ask for details. *Full Oceania Cruises terms and conditions apply. Please ask for further details. Other staterooms / suites are available. INCLUDES FLIGHTS, ACCOMMODATION, MEALS, EXCURSIONS AND LOTS MORE... Based on 2 adults sharing. Full terms and conditions are available on request. for our latest events visit fredolsentravelagents.co.uk and/or TraveQuest.co.uk All the prices quoted within are per person and based on 2 adults sharing unless otherwise stated. Each offer is correct at time of going to print and is subject to change, availability and can be withdrawn at any time. The individual operator terms and conditions also apply. E&OE.